With the right training and support, you can provide quality orthodontic care as a general dentist or as an orthodontic specialist. So what’s the difference and which is the better option? They can both be rewarding and have different benefits. This guide can help you determine the best fit based on the most common considerations. Which orthodontic training path is right for you? To specialize in orthodontics in the USA, you would first apply to one of the 68 accredited orthodontic residency programs1. After 2 or 3 years of full time training, you would specialize in orthodontics, treating patients only within this realm of care. This can be a great option if you know that you are passionate about orthodontics and only want to treat patients with orthodontic needs. If you are considering helping patients with braces but don’t want to limit your services, there are several orthodontic continuing education programs that can help you. While attending one of these programs, you can continue to provide general dentistry work, but would expand your services to include orthodontic care. While there are many orthodontic CE courses out there, this blog will focus on comprehensive orthodontic courses (18 to 24 months in duration), since this is more comparable to orthodontic residencies. Getting reputable GP orthodontic training can be the best option if you want to provide great care in a variety of areas and want (or need) to start making money already. Orthodontic residencies have a more extensive time commitment with residents dedicating 2 to 3 years full time for schooling. In this time, residents focus on their training in class and apply their knowledge during patient rotations at universities or hospitals. 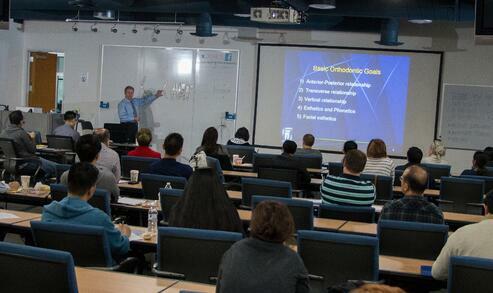 Comprehensive orthodontic continuing education programs are typically 18 to 24 month part time commitments. There are also a few extensive multi-level programs that add on an additional advanced or Master’s curriculum for a total of 3 or 4 years of part time education.2 Classes usually run a few days each month or a few days every few months. Since these are part time, you can continue to work and apply the training on patients in your office between sessions. 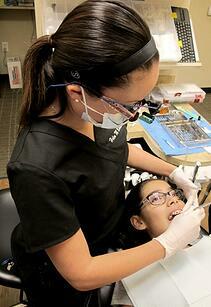 Orthodontists are trained to understand and treat all types of orthodontic cases. In residency, you get to try out many different types of products, systems and appliances and can listen to guest speakers that universities have access to. You’ll try several appliances, read the literature, and learn about the different systems to determine your favorites. 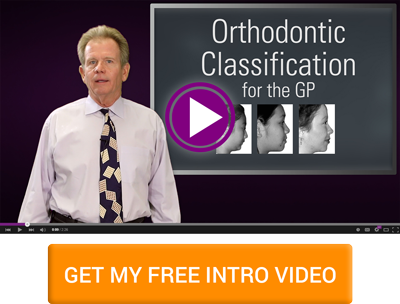 You’ll also get a good understanding of the historic figures and discussions that have happened in orthodontics. Dentists taking orthodontic CE programs typically don’t have the time and finances to learn the ins and outs of each orthodontic system like in a full time residency. Usually dentists will learn 1 or 2 systems that work well for them. Most GP orthodontic courses focus on the practical aspect of providing a high level of orthodontic care, and since there is less time, students may not get as much background with literature review, orthodontic history, and various systems. While there is some loss in this academic knowledge, most dentists that choose this option like how they can efficiently focus their efforts on getting a high level of diagnostic understanding and treatment ability. Orthodontics is known to be a very intellectual specialty, and clinical ability is greatly correlated with diagnosis experience. Thus, the best orthodontic work often comes from dentists and specialists that have seen and treated more patients. 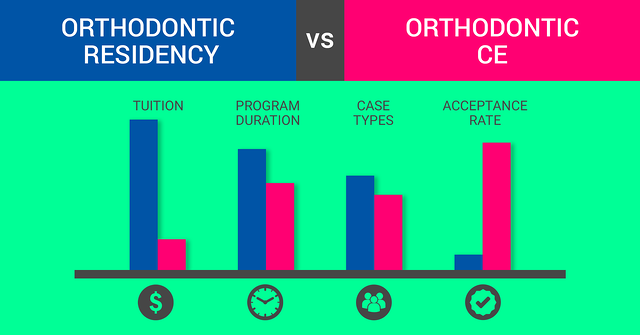 Since accredited orthodontic residency programs have guidelines and more training hours, there is more control over the ability graduates can expect to have. Residents rotate among hospitals or clinics to get their clinical and surgical experience. They usually diagnose, treatment plan, and follow several of their own cases throughout the program, and can have treated 10-50 cases by graduation. Graduates of comprehensive orthodontic programs can also have a high level of clinical skill, but it varies on the individual and the program. Like with residents, diagnosing cases and seeing their results is invaluable to gaining clinical orthodontic skills, but general dentists typically have the advantage of a greater breadth of experience in dentistry which can improve their diagnostic ability and retention. See 10 examples of orthodontic cases you can treat as a general dentist. Some CE programs have students diagnose and treatment plan 50+ instructional cases in class to give them confidence and ability. To ensure students can treat patients effectively, some programs have minimum completed case requirements of 1 or 2 patients. However, some ambitious GPs successfully treat 50, 100 or 200+ cases by the time they graduate their CE program. This case with high upper canines, crowding, mild Class II, and mild deep bite is just one example of an orthodontic case that general dentists can treat with the right training. In many communities there is more orthodontic demand than there are professionals to help. While there is a large pool of patients needing orthodontic care, specialists and dentists get their orthodontic patients in different ways. Orthodontists get their patients from other dentists, usually with referrals from multiple practices. To increase their patient source, they often build good relationships with dentists in the area or market to patients directly. GPs typically start orthodontic cases by discussing the dental needs and goals for their existing patients during routine exams. Although they can promote their orthodontic services, dentists usually get their orthodontic patients internally as their patients typically trust the dentist’s recommendations. Learn why many patients prefer to receive orthodontic treatment from their general dentist. Orthodontic specialization is a large financial investment. According to the American Association of Orthodontists’ data, tuition can cost up to a quarter of a million dollars.1 There are a few opportunities to get stipends to cover living or personal expenses. However, the majority (84.5%) of orthodontic residents do not get enough stipends to cover the amount for their tuition. There are a few programs (like Mayo College or Virginia Commonwealth) that have minimal tuition which can make learning financially feasible. Although orthodontists typically have higher salaries, many successful general dentists who have honed their skills and efficiency can see high profitability. Starting one case per week can generate up to $250,000 in revenue in just 1 year. Learn more about the economics of GP orthodontics. 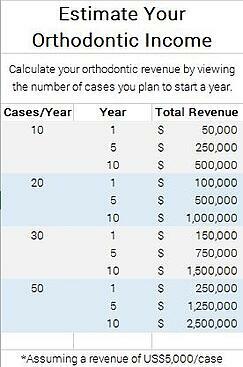 Want to calculate what your orthodontic income would be? Use the Orthodontic Financial Calculator. The rewards of helping your community with orthodontic care can be a satisfying addition to your practice. There are several ways that you can accomplish that goal as a dentist or as a specialist that can be both lucrative and professionally enriching. Your research will help you to decide what the best fit is for you and situation. Students can continue to work full time, earning income. 1: “Accredited Orthodontic Programs”. American Association of Orthodontists. Retrieved July 11, 2018. 2: “MSc Specialized Orthodontics – Study Structure”. McGann Postgraduate School of Dentistry. Retrieved May 25, 2016. 3: “Occupational Employment and Wages, May 2016. 29-1023 Orthodontists”. U.S. Bureau of Labor Statistics. Retrieved May 25, 2016. 4: “Occupational Outlook Handbook: Dentists”. U.S. Bureau of Labor Statistics. Retrieved May 25, 2016. Editors Note: This post was originally published in June 2016 and has been updated for freshness, accuracy and comprehensiveness. Now that you understand the different paths to treating orthodontics, which option seems like a good fit for you? Share in the comments!